A Russian cosmonaut, a NASA astronaut and an Italian wrapping up her first space flight boarded a Russian Soyuz ferry craft early Thursday, undocked from the International Space Station and plunged back to Earth, landing safely on the steppe of Kazakhstan to close out an extended 200-day mission. Soyuz TMA-15M commander Anton Shkaplerov, flanked on the left by flight engineer Samantha Cristoforetti and on the right by outgoing station commander Terry Virts, undocked from the lab’s Russian Rassvet module at 6:20 a.m. EDT (GMT-4) snd smoothly pulled away as the two spacecraft sailed 250 miles above Mongolia. 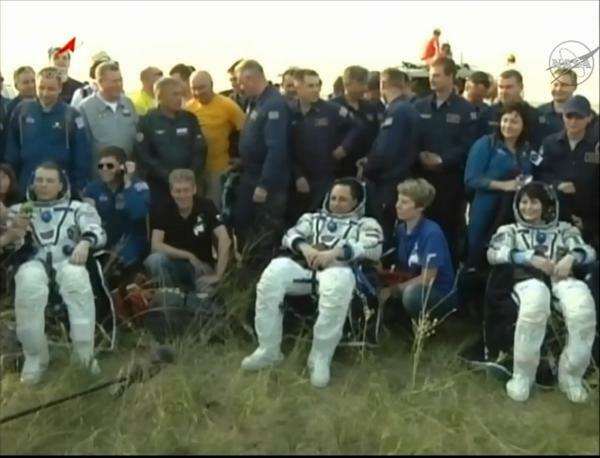 Left behind were Expedition 44 commander Gennady Padalka, NASA astronaut Scott Kelly and cosmonaut Mikhail Kornienko. Launched March 27 aboard the Soyuz TMA-16M ferry craft, Kelly and Kornienko are spending nearly a full year in space to help researchers learn more about the long-term effects of weightlessness and exposure to space radiation. “Thanks, Scott. 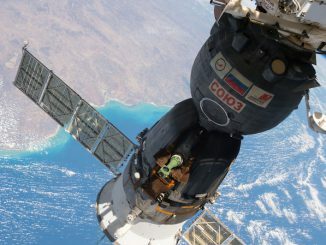 Miss you guys already,” Virts replied as the Soyuz pulled away. After moving to a point about seven-and-a-half miles from the space station, Shkaplerov monitored an automated four-minute 40-second deorbit rocket firing starting at 8:51 a.m., slowing the craft by about 286 mph and dropping the far side of its orbit deep into the atmosphere. About 22 minutes later, the three modules making up the Soyuz TMA-15M spacecraft separated as planned and the central crew capsule, oriented heat shield first and traveling at nearly five miles per second, slammed into the discernible atmosphere 62 miles above the Middle East at 9:21 a.m. Exiting the zone of peak aerodynamic heating, the crew module’s main parachute unfurled at an altitude of more than six miles, rapidly slowing the descent before a jarring rocket-assisted touchdown 92 miles southeast of Dzhezkazgan, Kazakhstan, at 9:44 a.m.
Russian recovery crews stationed nearby reached the descent module within a few minutes to help the returning station fliers out of the cramped capsule, carrying them to nearby recliners for satellite phone calls home and an initial round of medical checks. 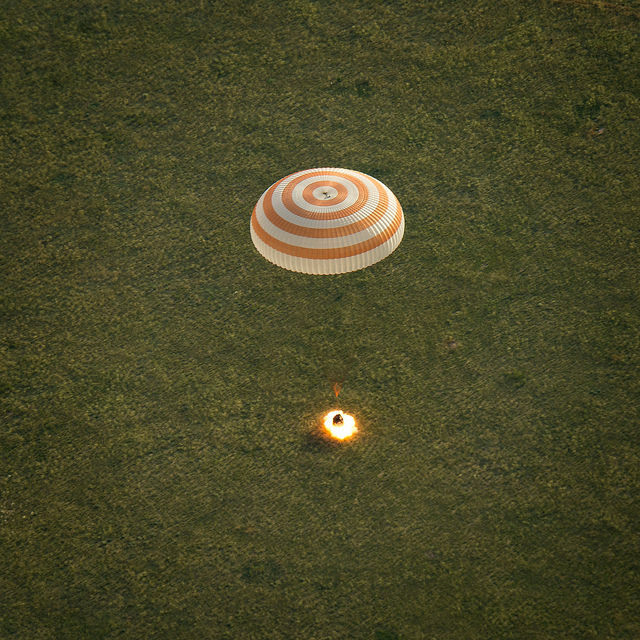 All three appeared healthy and in good spirits, enjoying ideal late afternoon weather as they began their re-adaptation to gravity after six-and-a-half months in space. Touchdown marked the end of a mission spanning 199 days and 16 hours since launch March 23 from the Baikonur Cosmodrome in Kazakhstan, a voyage covering 3,184 orbits and 84.2 million miles. Shkaplerov and his crewmates originally planned to return to Earth on May 13, clearing the way for launch of three fresh crew members on May 27. But after an April 28 launch failure that sent a Progress supply ship spinning out of control, Russian mission managers decided to delay the next Soyuz launch to late July to give engineers time to figure out what went wrong and implement corrective actions. At the same time, they delayed the return of Shkaplerov, Virts and Cristoforetti to keep a full crew of six on board the station for as long as possible to maximize the crew time available for research and maintenance. The landing delay also gave Cristoforetti, completing her first flight, time to set a new record — 199 days 16 hours — for the longest single mission by a female astronaut or cosmonaut. 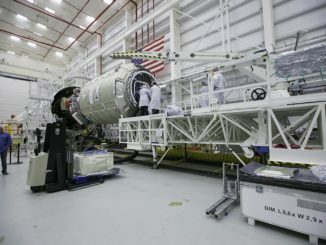 Last Sunday, she moved past NASA astronaut Sunita Williams, who logged 195 days aloft in 2006-07. Shkaplerov’s time in space over two missions now stands at 364 days while Virts’ total, including a space shuttle flight, stands at 212 days. After a final round of medical tests, the crew was to be flown by helicopter to Karaganda for an official Kazakh welcoming ceremony. Then Shkaplerov will fly back to Star City near Moscow while Virts and Cristoforetti board a NASA jet for the long flight back to Houston and the Johnson Space Center. Padalka, Kelly and Kornienko will have the station to themselves for the next month and a half. 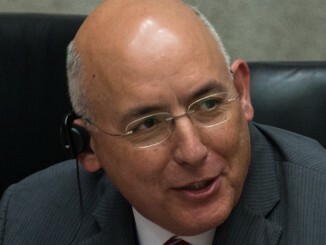 With only three crew members on board, the pace of research will be reduced until the Soyuz TMA-17M crew arrives in late July, but Kelly said in an earlier interview he did not expect any problems conducting the on-going medical research. Padalka, making his fifth space flight, is the first person to serve as station commander four times. He will become the world’s most experienced space flier on June 28, eclipsing cosmonaut Sergei Krikalev’s record of 803 days across six space flights. When he returns to Earth in September, Padalka’s record will stand at 877.6 days. Because Kelly and Kornienko are spending nearly a full year in space, the Russians plan to launch a Soyuz ferry craft — TMA-18M — on a so-called “taxi” flight on Sept. 1 carrying commander Sergey Volkov, ESA astronaut Andreas Mogensen and a yet-to-be named cosmonaut. The third seat originally was taken by singer and would-be space tourist Sarah Brightman, but she recently withdrew for undisclosed reasons. In any case, Padalka will serve as commander of Soyuz TMA-16M, the same craft that carried him into orbit, returning to Earth Sept. 11 with Mogensen and the yet-to-be-named cosmonaut. Volkov will remain aloft and serve as commander of the TMA-18M spacecraft, escorting Kelly and Kornienko home next March.